The Indian democracy has matured, stabilised and evolved over seven decades since its independence. Unlike our neighbours and some African and West Asians countries, the Indian Army, the fourth largest in the world, has remained apolitical and has served the government of the day with utmost sincerity, dedication and above all loyalty. But for a motivated and propped up rumour of a likely coup in 2011, there never ever has been any plotting or effort by Army to try and wrest power from an elected government. On the contrary, before clamping the emergency when Indira Gandhi offered the Army to take over the governance of the country, the then Army Chief politely declined. The Armed Forces by far had their golden period under the leadership of PM Vajpayee who, as was his nature, respected all institutions of the state and held the Armed Forces in high esteem. As a starter, he put a strong and widely known leader George Fernandes as the Defence Minister. Fernandes visited Siachen and other forward areas frequently. In the Army we maintain that one look on the ground is better than a thousand briefings. When the bureaucrats failed to appreciate the need and were trying to block the introduction of snow scooters and other state of the art equipment required to fight the vagaries of nature in Siachen, Fernandes sent the bureaucrats to Siachen to acquire a first-hand knowledge on the ground. The required equipment was rapidly inducted thereafter. What the PV Narasimha Government could not achieve under pressure from the US, Vajpayee Government did silently but resolutely by having successful tested controlled nuclear explosions in Pokhran. India formally joined the exclusive nuclear club. The entire plan was etched in utmost secrecy with full faith in the Army to be in overall command and have requisite freedom and flexibility to execute the plan. Western countries took note of the rising Indian nation with resolve to become a responsible regional power. Vajpayee was an apostle of peace and made genuine efforts to bring peace between India and Pakistan. A half-witted General Musharraf stabbed him and his own PM Nawaz Sharif in the back by sending regular army cadres and terrorist across the Line of Control (LC) in Kargil. Vajpayee was not shaken but in his stoic demeanour backed his Armed Forces in their efforts to evict the Pakistani Intruders. 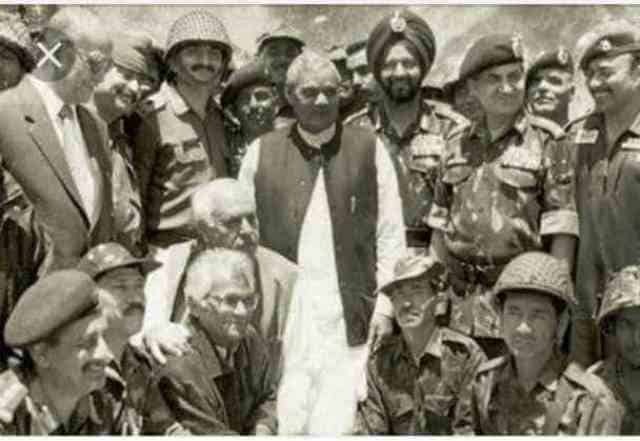 Being a statesman and visionary of a very high order, Vajpayee asked the Armed Forces to show restraint and not cross the LC while evicting the intruders. Even at a higher cost to the lives of brave Indian soldiers, without crossing the LC, the intruders were thrown out and nefarious designs of Pakistan were exposed to the world once they failed miserably. The fact that both India and Pakistan had recently turned nuclear, ensured that the war remained a limited one and almost eliminated chances of total future wars in the subcontinent. The restrained but tough stance taken by Vajpayee Government gave a new legitimacy to LC as the de-facto border between India and Pakistan in Jammu and Kashmir. A grateful Vajpayee Government at the end of the war wanted to reward their Armed Forces and really wanted to do something meaningful for the larger welfare of the troops; a thought that had never crossed the minds of any previous or successive governments. They asked the then Chief of the Army Staff, who after discussion with his confident advisors, asked for making married accommodation for cent percent soldiers in peace stations. Thus the Married Accommodation Project (MAP) was authorised which is still going on. After a short gap of two years, Pakistan again tested the patience and nerve of Vajpayee government by masterminding an attack on the Indian Parliament in December 2001. The attack was foiled by security forces but the PM took firm action and mobilised the Indian Army on the Western Borders within three days. Musharraf realised that this time he had bitten too much and was horrified when the Indian Army mobilised in record time and was preparing for an offensive in beginning of January 2002. He went on national television on 11 January and ensured India that he will rope in the terrorists infiltrating into Jammu & Kashmir. Vajpayee went along with the Army top brass when they requested for some more preparatory time for an offensive and a May 2002 option was worked out. Diplomatic efforts by western world headed by US to stop two nuclear neighbours from going to war paid off and averted the war in May and later months. Op Parakram, however, ushered in Coercive Diplomacy in the subcontinent and Pakistan promised to play ball. Having been forced to fight a war, PM Vajpayee continued to strive for peace in the subcontinent and invited the new President and the architect of the Kargil misadventure, Gen Musharraf for talks to Delhi and Agra. The talks failed as Pakistan did not agree to bury the Kashmir issue. At the recommendation of the Director General of Military Operations duly endorsed by the Army Chief, PM Vajpayee agreed to a unilateral ceasefire along the LC in 2003. Crores of rupees were saved every month on the ammunition which was being spent; in addition to minimising mindless casualties to own troops and civilians. The Pakistanis also realised the fruits of ceasefire on the LC and the arrangement was formalised after six months. This ceasefire remained intact but for a few aberrations, which were regularly protested; till the present Government ordered surgical strikes in 2016. When the present BJP Government took oath in 2014, Armed Forces had great expectations and hoped that the process that was started by Vajpayee to bring in the necessary reforms in the Armed Forces, which was put on the back burner by Congress ; would be given a boost. The opposite has happened and Civil Military relations are at the lowest ebb. We have had four Defence Ministers in as many years and all have either been political light weights or have held Defence Ministry as an extra charge. The Central Government has exactly one year before 2019 elections to win over the confidence of serving soldiers and veterans to peek through the filters created by bureaucracy and follow the path paved by Vajpayee Government.